This article is about the town in Shropshire. For other uses, see Telford (disambiguation). 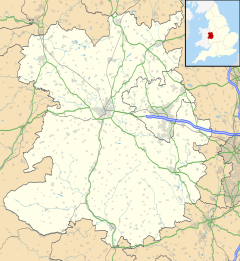 Telford (/ˈtɛlfərd/ ( listen)) is a large new town in the borough of Telford and Wrekin and ceremonial county of Shropshire, England, about 13 miles (21 km) east of Shrewsbury, and 30 miles (48 km) north west of Birmingham. With an estimated population (for the borough) of 175,271 in 2017 and around 155,000 in Telford itself, Telford is the largest town in Shropshire, and one of the fastest-growing towns in the United Kingdom. The Town Centre viewed from the western end of Telford Shopping Centre, with the blue Telford Plaza buildings in the distance. It is named after civil engineer Thomas Telford, who engineered many road and rail projects in Shropshire. The town was put together in the 1960s and 1970s as a new town on previously industrial and agricultural land and smaller towns. Like other planned towns of the era, Telford was created from the merger of other, smaller settlements, most notably the towns of Wellington, Oakengates, Madeley and Dawley. Many of the New Town's newer inhabitants were originally from Birmingham or Wolverhampton. Telford Shopping Centre, a modern shopping mall, was constructed at the new town's geographical centre, along with an extensive Town Park. The M54 motorway was completed in 1983, improving the town's road links with the West Midlands conurbation. On Telford's southern boundaries is the Ironbridge Gorge, a scenic tourist destination and UNESCO World Heritage Site. The town advertises itself as "The Birthplace of Industry", due to it having Coalbrookdale and other places in the Ironbridge Gorge area, within its boundary. These areas are internationally recognised as being important to the Industrial Revolution, and being to a large extent constructed on the Shropshire Coalfield. Its influence was greatly used to further Birmingham’s industry through innovations as well. Early settlement in the area was thought to be on the land that sloped up from the Weald Moors (an area north of the town centre) towards the line along which the Roman Watling Street was built. Farmland surrounded three large estates in the 10th century, namely Wellington, Wrockwardine and Lilleshall. From the 13th century there was urban development in Wellington and Madeley, where Wenlock Priory founded a new town. Six monastic houses, founded in the 11th and 12th centuries, had large interests in the area's economic growth. They collectively acquired almost half of the area, and profited from coal and ironstone mines and iron smithies on their estates. The New Town was first designated on 16 January 1963 as Dawley New Town, covering 9,100 acres (37 km2) of Dawley, Wenlock, Oakengates, Wellington Rural District and Shifnal Rural District. Development started, guided by the Dawley New Town Development Corporation, with the first homes on the new Sutton Hill housing estate being occupied in 1967. Initial planning and design concepts for Dawley New Town were produced by the Birmingham-based John Madin Design Group. The Minister proposed an extension of 12,000 acres (49 km2) in 1968 (taking in the historic area of Ironbridge Gorge), which saw objections and a public inquiry take place. The Dawley New Town (Designation) Amendment (Telford) Order was made on 29 November 1968, extending the New Town area by 10,143 acres (41.05 km2) of "land lying within the urban districts of Oakengates and Wellington and the rural districts of Shifnal and Wellington". This Order also renamed the new town Telford, after the Scottish-born civil engineer Thomas Telford who, in 1787, became Surveyor of Public Works for Shropshire. Other suggested names at the time were Dawelloak and Wrekin Forest City. Most of the infrastructure was constructed from the late 1960s and throughout the 1970s with the major housing and commercial development occurring over three decades up to the early 1990s when the Development Corporation was wound up to be replaced by Commission for the New Towns, later English Partnerships, and most of the property was handed over to the then Wrekin District Council. Telford was now 25 years old and was firmly established as one of the most important towns in the region. In 1983, after fierce opposition and three public enquiries, the M54 motorway was completed, connecting the town to the M6 and thence the rest of the UK's motorway network. Other major roads are the A5, A518 and A442, which is commonly known as the Eastern Primary or EP, and is officially branded Queensway. Many of the new town's residents were originally from the West Midlands conurbation, which includes Wolverhampton, Birmingham, Dudley and Walsall. The vast majority of the council house tenants in Telford were rehoused from inner city Birmingham. Some individuals still refuse to put Telford in their address, instead using the original local name (such as Wellington or Dawley) and often citing the existence of Town Councils as support for the argument "you can't live in a town in a town," e.g. Wellington (Town) Telford (Town). The new town's residents who arrived in the 1960s and 1970s earned the unwanted nickname "overspill" from people living in the existing towns and villages. In 2007, a £250 million regeneration plan for the town centre was announced, which will include the pedestrianisation of the road surrounding the shopping centre, and the creation of new cafés, bars and shops which will lead to 1,750 new jobs. The reason for this expansion is that the original "centre" was only ever a shopping place with no real heart (See Shropshire Star 3 June 2004). Since the "centre" closed early evening, there was no nightlife at all in the area, the only major local entertainment areas being in Oakengates and Wellington. The first phase of the town centre development, named Southwater, was completed in 2014. The official opening ceremony on 18 October 2014 included live music and fireworks. The area comprises a refurbished library, various chain restaurants, Cineworld IMAX Cinema, bowling alley/arcade and a new multi-storey car park. Telford town centre lies about 21 kilometres (13 mi) east/south-east of Shrewsbury and 24 kilometres (15 mi) north-west of Wolverhampton. The town comprises 7,803 hectares (30.13 square miles) and its southern and eastern parts, between the Severn Gorge and Donnington Wood, include the East Shropshire coalfield. North and north-west Telford lie beyond the coalfield's boundary fault on sandstone beds which, along with other Triassic formations, prevail over much of the North Shropshire plain. The town centre stands on a watershed, with land to the south draining towards the River Severn, and to the north the land slopes gently down towards the Weald Moors. The town is dominated by the Wrekin, a large hill of 407 m (1335 ft), located south-west of Wellington, straddling the border with the unitary Shropshire Council (before the latter's creation in 2009 the borough of Shrewsbury and Atcham). Ward map; Telford urban area highlighted in orange, within the Telford and Wrekin borough. For more information on Parish divisions, see list of civil parishes in Shropshire. Within the borough of Telford & Wrekin, the town is entirely parished. Telford has no single town council because of this, and the Mayor of the Borough of Telford and Wrekin is also de facto the town's mayor. The town is also divided into Wards, within the Telford and Wrekin borough. These are used for electoral purposes and demographic surveys. Telford was created politically – but its attempts to make a cohesive town from the fusion of other independent, smaller towns: Wellington, Madeley, Hadley, Oakengates, Dawley, Ironbridge and Donnington have largely been successful. Despite this, the town has much clearer divisions than in other older towns, such as nearby Shrewsbury, which have developed into one consolidated urban area over time. Some small settlements to the south such as a part of Ironbridge and Broseley, while part of the Telford Urban Area, are administered by Shropshire Council. Telford is the only settlement within the Telford parliamentary constituency, which was held by Labour from its creation in 1997 until the 2015 General Election. The current MP is Lucy Allan (Conservative). Some suburbs, such as Wellington, are located in The Wrekin, which also has varying support between the Conservatives and Labour. Conservative Mark Pritchard was reelected as MP in 2015. Telford is administratively part of the West Midlands region. A clickable link map of the component towns of Telford and surrounding villages. In 1963 Dawley new town was intended to take 50,000 people from the West Midlands conurbation and so to grow to a town of 70,000 or more. By 1968 Telford was intended to take an additional 50,000 and grow to a town of 220,000 or more by 1991. By 1983, however, Telford's population was just under 108,000, and it was generally thought that it might not reach 120,000 by the late 1980s. Telford has a younger than average population, and a higher rate of teenage pregnancy than the national average, as well as relatively high levels of income deprivation with 15% of residents living in low income households. In addition the level of statutorily homeless households in 2004/05 was above average for England. The Telford and Wrekin area is a popular commuter zone, containing some relatively rural areas in the North and West of the borough. These are popular with commuters to the West Midlands conurbation, due to the good transport links provided by the A5/M54. Telford's population is predominantly White, comprising 93.8% of the population as of the 2001 census. The next largest ethnic group is those of Asian descent, comprising 3.3% of the population, which is again less than the West Midlands at 8.0%, and England at 5.3%. However, the town and borough remains comparatively more ethnically diverse than the ceremonial county, with South Shropshire for example being 97.8% white. Compared with the nearby West Midlands conurbation, Telford has a relatively high white population. In 2011, the town was 91.9% white (88.5% White British), 4.7% Asian, 1.2% Black, 1.9% Mixed race and 0.2% other. At the same census the population of the town was 142,723 and had an area of 46.2 kilometers with the population estimated to be 147,105 in 2016. During the economic crisis of the late 1960s (with unemployment doubling nationally during the second half of the decade), unemployment in the then-new town was initially high. However, in 1967 Halesfield Industrial Estate was founded on the south-eastern edge of the town – the first real answer to Telford's unemployment problems. Other large estates followed, in 1973 with Stafford Park just east of the town centre and in 1979 with Hortonwood, to the north, helping ease the unemployment crisis in a decade which saw an almost unbroken rise in unemployment. In total, half a million square metres of factory space were provided between 1968 and 1983, making Telford an attractive investment area. By 1976, Telford had begun to recruit industry from the USA, Europe, and Japan. The foreign firms required larger factories, and they began to be built at Stafford Park. By 1983 over 2,000 jobs in Telford were provided by around 40 (mostly American) foreign companies. In contrast to industry in the Black Country at the time, these new companies focused on high-technology industries rather than the heavy and metal-finishing industries. The new arrivals included the American company Unimation and three firms from Japan: Nikon UK Ltd., which opened a warehouse at Halesfield in 1983; video tape manufacturers Hitachi Maxell at Apley Castle in 1983; and office equipment manufacturers Ricoh, who took a 22-acre (89,000 m2) site for a factory at Priorslee next to the M54, and formed the first in Telford's new enterprise zone. Consequently, from the later 1970s, Telford began to attract high-technology firms and to diversify its industry, and the promotion of the Service industry also began to prosper, in the Telford Town Centre area. However, a deepening national recession meant that, despite the creation of new jobs, there were net job losses from 1979. Unemployment grew from 3.4 per cent in 1969 to over 8 per cent in 1972 and 22.3 per cent (almost double the national average) in 1983; long-term unemployment rose even faster. Nevertheless, the rate of increase in unemployment was slowing down by 1983 and was making some progress against national and regional trends. Unemployment in Telford was still around the 20% mark – nearly double the national average at the time – as late as 1986. The Lawson Boom of the next three years saw that figure fall dramatically by the end of the decade, only for it to rise to a similarly high figure again by 1992 as a result of the early 1990s recession. Telford has attracted several large IT services companies, including EDS who support the MOD contract from the Euston Park site, as well as a vast array of clients across the world from the Plaza building. Also Capgemini and Fujitsu employ a significant number of staff in the area, mainly supporting their governmental client, Her Majesty's Revenue and Customs (HMRC). The expansion in these job sectors provided a great asset to Telford's economic recovery after 1992. By August 2007, the success story of Telford's economy had seen unemployment shrink to 3.3% – a fraction of its peak 15 years earlier. However, the subsequent recession meant that unemployment in the area had risen to 5% by February 2011, although this was still well below the national average. The Shropshire Star evening newspaper is based at Ketley, Telford. There have been job losses, with the movement of 500 Defence Logistics Organisation (DLO) jobs at the MoD base at Sapphire House, Telford, to Bristol. The sugar beet factory at Allscott closed in 2007. The commercial centre of the town is the aptly named Telford Town Centre, located off Junction 5 of the M54 motorway, completed in the 1980s. It is home to the administrative headquarters of Telford & Wrekin council, which are now based at Addenbrook House on Ironmasters Way, after moving from Civic Offices in December 2012. The large Telford Shopping Centre (and the accompanying Town Park), various office blocks, such as the blue office towers (Telford Plaza), and the Windsor Life building. The Forge retail park and a large Odeon Cinema are also located in the area. Telford also houses one of the Midlands' few ice skating rinks near the newly built Telford International Centre (TIC). The TIC comprises a number of hall and event spaces. It holds parties, conferences, concerts and was formerly the venue of the UK Snooker Championship. A major Shropshire landmark, also now part of Telford, is The Iron Bridge, located in Ironbridge. It was the first bridge of its size in the world made out of cast iron. In the same area is the Ironbridge Gorge, a UNESCO World Heritage Site. The most important landmark in the area is The Wrekin. There is also the Lilleshall Monument erected to the Duke of Sutherland, which has recently been restored. Telford has a number of primary and secondary schools including Thomas Telford School, a City Technology College (CTC), which claims to have a 100% pass rate at GCSE level, with all students achieving at least 4 GCSEs grades A*-C, placing it at number one in the entire country for Key Stage 4 attainment. It was students of this school who were chosen to construct Airfix models of planes and tanks, and to assist Top Gear co host James May construct a life size model of a World War II Spitfire on the first episode of the series James May's Toy Stories. The school's choir has gained lots of notability after their various performances up and down the country, including the Royal Albert Hall for the Music For Youth School Prom, along with performances hosted by CBBC's Barney Harwood. Abraham Darby Academy (Performing Arts, Business and Enterprise), formerly known as Abraham Darby Specialist School for the Performing Arts, provides specialist performing arts education and is home to one of the UK's best school concert bands which has performed at prestigious venues such as Birmingham Symphony Hall, Royal Festival Hall London, Royal Albert Hall and also Carnegie Hall, New York. They regularly perform at national and international competitions, such as the world music contest in Kerkrade, Holland, and Music For Youth. Further education is handled by Telford College of Arts and Technology (TCAT) and Telford New College, a sixth-form college located in Wellington. There are four other sixth forms located at Abraham Darby Academy, Holy Trinity Academy, Madeley Academy and Thomas Telford School. 8 miles (13 km) to the north are Adams' Grammar School and Newport Girls High School selective schools located in nearby Newport. Telford is home to The University of Wolverhampton Business School (UWBS) campus and the School of the Built Environment. Harper Adams University, a famous university for land-based education is located near the town of Newport. Madeley Academy is a sport college and a building that was built and opened in September 2009. In 2006 Telford & Wrekin became one of three pilot areas selected as part of the Department for Culture, Media and Sport's Cultural Hubs programme piloting a cultural offer for young people and schools across Telford & Wrekin through the Council's Telford Culture Zone programme at the heart of which was effective partnership working and joint planning between the cultural and education sectors. In July 2012 the Department for Education and Arts Council England selected Telford & Wrekin as one of the new areas for the in Harmony programme working with Old Park Primary School and Children's Centre, Telford & Wrekin Music, City of Birmingham Symphony Orchestra and the Manchester Camerata. In Harmony is a national programme that aims to inspire and transform the lives of children in deprived communities, using the power and disciplines of community-based orchestral music-making. The M54 shown here near Junction 5 for Telford Centre, which is visible in the background to the left. Telford is situated at the terminus of the M54 motorway, a spur of the M6 linking the town with Wolverhampton and the West Midlands, and on the A5 road between Shrewsbury and Cannock. The town has three railway stations on the Shrewsbury to Wolverhampton Line: Wellington, Oakengates and Telford Central. A service to Walsall was introduced from Wellington via Wolverhampton but proved to be unprofitable and the service was withdrawn along with the service from Walsall to Wolverhampton in December 2008. A new direct train service to London was launched by Wrexham & Shropshire in 2008. The venture however proved unprofitable and ceased to operate on Friday 28 January 2011, leaving Shropshire as the only English county without a direct train link to London; that is until Virgin Trains launched a direct Shrewsbury to London service in December 2014 In addition, there are two further stations isolated from the national network, Spring Village and Horsehay & Dawley, at Telford Steam Railway, situated at Horsehay. Telford's rapidly growing population still has a relatively low car ownership. In 2004 Telford & Wrekin council was awarded 'Beacon Status' for improving access to public transport. Being a new town with a planned transport infrastructure, the town features relatively few traffic problems, in comparison to the urban areas of Birmingham or medieval streets of Shrewsbury. The M54 reduces through-traffic on local roads, and the A442 Queensway acts as a north-south artery road. Professor Steve Molyneux (born 1955) education expert, Mayor of Oakengates from 2003-2007, has resided in Telford since 1991. Jeremy Corbyn Leader of Labour Party, was raised and educated within the borough of Telford & Wrekin, and was active in The Wrekin constituency Young Socialists and the local Labour Party. Norman Jones (1932 in Donnington – 2013) an English actor, primarily on TV. Christian Brassington (born 1983 in Wellington) a film and television actor. John Pender (born 1963) a retired English professional footballer  with 496 appearances, mainly for Wolves and Burnley, now lives in Telford. Richie Woodhall (born 1968) former WBC super middleweight champion boxer, grew up in Woodside, Telford. Elliott Bennett (born 1988 in Telford) professional footballer, grew up in Telford, plays for Blackburn Rovers. Kyle Bennett (born 1990 in Telford) an English footballer, plays for Bristol Rovers. Connor Goldson (born 1992) professional footballer, attended Thomas Telford School in Telford. T'Pau (formed 1986) a British pop group whose members are from Telford (Wellington) and Shrewsbury. Cancer (formed in 1988) a death metal band from Ironbridge. The Sunshine Underground (years active 2000–2016) an alternative dance band, originally from Telford and Shrewsbury, formed while studying at New College Telford. David Brown (born 1987) is a British YouTuber and musician. Telford is home to a variety of established amateur, semi-pro and professional sports clubs. AFC Telford United Football Club are currently playing in the National League North having been relegated from the Conference Premier at the end of the 2014–15 season. AFC Telford's achievements include Best Shropshire Senior Cup Performance: Final – 3 Times, and Promotion to Conference North in 2007, after beating Witton Albion in the play-offs 3-1. Also, they won the Setanta Shield Trophy by beating Forest Green Rovers on penalties in 2009. They were formed in 2004 on the bankruptcy of the previous Telford United club, who had competed in the Football Conference – the highest level of football outside the professional league – for 25 years since its inception in 1979 as the Alliance Premier League and were winners of the FA Trophy on three occasions. Ice hockey in the town is represented by 2 teams. One is the Telford Tigers, an English Premier League (EPL or EPIHL) ice hockey team originally formed in 1985. The other are the Telford Titans, an ENL Team, which represents development hockey feeding from the excellent youth development and were last year crowned league champions. American football teams in the town, have included Shropshire Revolution, Wrekin Giants (1985–1989), Shropshire Giants (1989), and Cannock Chase Giants (1989-1993/4). Telford Raiders are the town's Rugby League club, although there have been other Rugby League Clubs in Telford historically, such as the Telford All Blacks and Shropshire Scorpions. Telford Hornets represent the town at Rugby Union. Shropshire Warriors Basketball Club play at Telford College of Art and Technology (TCAT). Telford also hosted the UK Snooker Championship, from 2007 to 2010. The championship moved from York in 2007 but returned to the refurbished Barbican Centre in York since 2011. The Shropshire Golf Centre is located near Muxton, to the northeast of Telford. This has three nine-hole courses, a 13-hole par three academy course and driving range. Other courses include Horsehay Village Golf Club, The Wrekin Golf Club and Telford Golf and Country Club. There are cricket clubs, who compete in local leagues. Wellington is where many Shropshire County matches are played. ^ a b "Telford (Telford and Wrekin, West Midlands, United Kingdom) - Population Statistics, Charts, Map, Location, Weather and Web Information". www.citypopulation.de. ^ Council, Telford & Wrekin. "Telford & Wrekin Council download - Key facts sheets About my council | Facts and figures". www.telford.gov.uk. Retrieved 2019-02-25. ^ "Telford Town Centre". Archived from the original on 7 July 2007. Retrieved 2 October 2007. ^ Poulton-Smith, Anthony (2009). Shropshire Place Names. Stroud: The History Press. p. 137. ISBN 978-0-7524-4889-3. ^ a b c d "History of Telford". British History Online. Retrieved 21 March 2008. ^ London Gazette. 18 January 1963. ^ London Gazette. 13 December 1963. ^ "30 years on - how opening of M54 brought new dawn for Shropshire". Shropshire Star. 25 November 2013. Retrieved 29 April 2016. ^ "BBC Shropshire – Redevelopment scheme unveiled". BBC News. 19 October 2007. Retrieved 19 October 2007. ^ "Telford's Southwater opening schedule is unveiled". Shropshire Star. 13 March 2014. Retrieved 14 December 2015. ^ "Southwater Grand Opening". Telford Shopping Centre. 2014. Retrieved 14 December 2015. ^ "Rotary Club of The Wrekin". D1210.org. 31 March 2008. Archived from the original on 6 November 2009. Retrieved 28 June 2009. ^ Dept. of Econ. Affairs, The W. Midlands: a regional study (1965), 3–4, 84. ^ "Association of Public Health Observatories – Health Profiles" (PDF). Communityhealthprofiles.info. 11 June 2008. Archived from the original (PDF) on 9 June 2008. Retrieved 28 June 2009. ^ "Neighbourhood Statistics – Telford & Wrekin". Retrieved 10 March 2008. ^ "Neighbourhood Statistics – South Shropshire". Retrieved 10 March 2008. ^ Telford Development Strategy: 1st Monitoring Rep.-7th Monitoring Rep. (T.D.C. 1978–84); (for no. of jobs on T.D.C. estates in 1978) T.D.C. Employment in Telford 1979 (1980), 20; no. of jobs on T.D.C. estates 1979–82 supplied or confirmed from T.D.C. bd. mtg. agenda 10 November 1983 (management accts. 1983-4, physical projections, p. 12). ^ Private inf. ; Thomas, 'Telford', 36-7; Fenter, 'Bldg. Development in Telford'; Reps. of Dev. Corporations 31 March 1969, H.C. 398, pp. 469–70 (1968–69), xliii; 31 March 1983, H.C. 81, p. 317 (1982–83); Town Planning Rev. xliii. 360 n. 52. ^ The Times, 24 November 1983 (p. 22). ^ Reps. of Dev. Corporations 31 March 1983, 309. ^ T.D.C. Telford Ind. Dir. [c. 1979], 28. ^ Shropshire Star, 12 November 1983 (p. 3). ^ N. Staffs. Jnl. Field Studies, xiii. 78; Telford Development Strategy: 6th Monitoring Rep. (T.D.C. 1983), 8–12, 22–8; B. Trinder, Hist. Salop. (1983), 121; Shropshire Star, 10 March 1982. ^ "Oneplace homepage". Oneplace.audit-commission.gov.uk. 20 January 2013. Archived from the original on 17 December 2010. Retrieved 29 May 2013. ^ "Shropshire Routes to Roots | Transport and communication | From trackways to motorways". .shropshire-cc.gov.uk. 1 August 2007. Archived from the original on 25 September 2008. Retrieved 29 May 2013. ^ "Economy tracker". BBC News. 17 August 2011. ^ a b "'We love Telford!' Town bites back at gipsies and pickpockets train remark". Shropshire Star. 28 July 2016. Retrieved 28 July 2016. ^ "Cultural Hubs baseline report". Arts Council. 1 March 2006. Archived from the original on 9 June 2013. Retrieved 29 May 2013. ^ "In Harmony". Arts Council. Archived from the original on 25 October 2012. Retrieved 29 May 2013. ^ "Thesis Vanilla | Base Theme for Sites". Wrexhamandshropshire.co.uk. 18 January 2012. Archived from the original on 10 February 2011. Retrieved 29 May 2013. ^ BBC. "New rail link between Shropshire and London". bbc.co.uk. ^ "Department for Transport – Better local public transport". Dft.gov.uk. 14 July 2004. Archived from the original on 22 November 2008. Retrieved 28 June 2009. ^ The road ahead. "Shropshire – Travel – The road ahead". BBC. Retrieved 28 June 2009. ^ "M54, The Telford Motorway". The Motorway Archive. Archived from the original on 9 October 2008. Retrieved 18 April 2008. ^ "Magistrate resigns in Twitter row". BBC News. 25 April 2009. Retrieved 29 July 2016. ^ Hanning, James (9 March 2014). "Stewart Lee: Beware - this man may be only joking". The Independent. Retrieved 29 July 2016. ^ "Pual Blackthorne Celebrity". TV Guide. Retrieved 29 July 2016. ^ "Christian Barrington - Biography". IMDB. Retrieved 28 July 2016. ^ "The Richie Woodhall collection: My dad taught me to fight". Shropshire Star. 11 December 2015. Retrieved 29 July 2016. ^ "Shropshire football star's father in road rage headbutt". Shropshire Star. 28 November 2013. Retrieved 29 July 2016. ^ "Blackburn sign winger Elliott Bennett from Norwich City". The Guardian. 6 January 2016. Retrieved 29 July 2016. ^ "Current Professional Players". The Shropshire schools and colleges football association. Retrieved 29 July 2016. ^ "My Shropshire Life - Carol Decker". Shropshire Life. 3 November 2011. Retrieved 28 July 2016. ^ "Interview: The Sunshine Underground". The Native Monster. 9 May 2014. Archived from the original on 20 August 2016. Retrieved 28 July 2016. ^ "warriorsbasketball | INFO". warriorsbasketball. Retrieved 2019-02-25. Wikimedia Commons has media related to Telford. Wikivoyage has a travel guide for Telford.